Climate in the Brazilian Island of Fernando de Noronha. 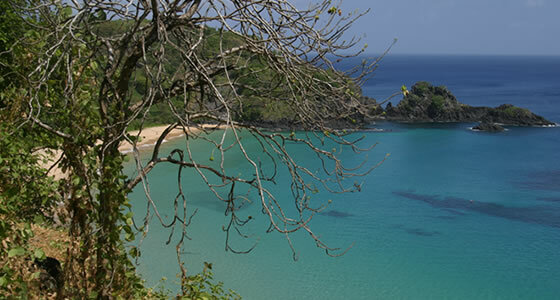 The climate in Fernando de Noronha is very consistent throughout the year. Weather is tropical and the sun is seen almost all the days of the year. Only two seasons mark the calendar. September to March is dry and the rainy season is from April to August. October is the month when it gets very hot and summer is dry with humidity at around 81%. However, rains generally don’t last long on the island. The tropical showers are always followed by sunshine. So far the island hasn’t recorded any instances of cyclones, hurricanes or earthquakes. There is no winter on this island. Summer is winter for Brazil. Temperature is around 28 degrees centigrade. The temperature of water is very soothing at 80 degrees F, and that makes swimming enjoyable in the natural pools of Fernando de Noronha. After heavy bouts of rain, the natural trails on the island become muddy and tend to vanish with the rain. So always check the weather forecast before heading on a trail. Umbrellas, hats, glares, sun block, sun tan lotions, insect repellent creams are must have when vacationing on this island. However some areas marked for scuba diving prevent the use of sun blocks, so check before scuba diving.